With the ever growing number of parents who work unpredictable hours, it’s no surprise that there are now over 700,000 daycare facilities in the U.S. 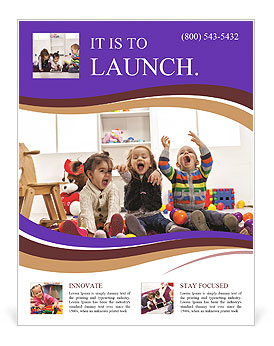 If you’re a daycare business owner or planning to be one, you’ll need flyers to reach parents in your community. 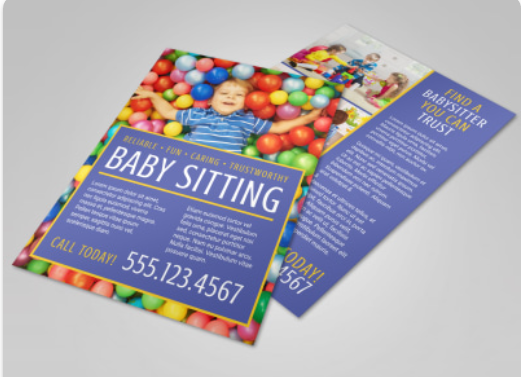 When your design is ready, use Vistaprint to start printing your daycare flyers in full color. Vistaprint gives you the tools to upload your design and print on a variety of paper size and quality to fit your requirement starting at $9. 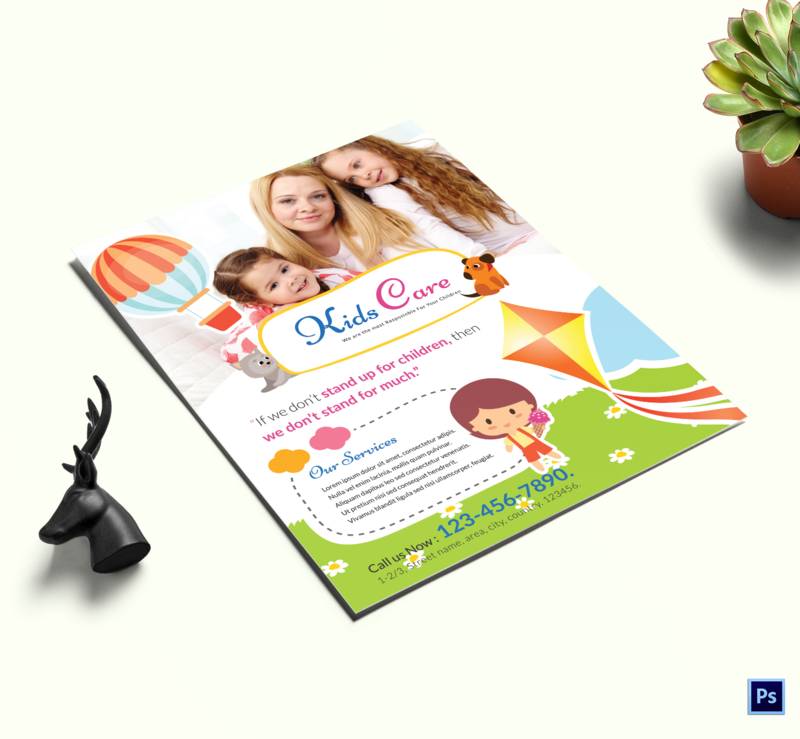 These 25 daycare flyer templates will fit any budget to help you get started. 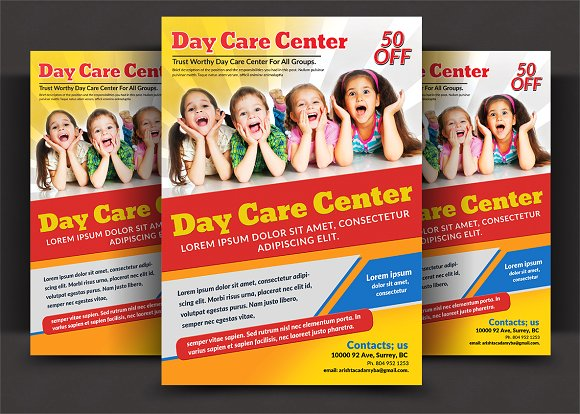 Easily customizable and editable, this professional looking daycare flyer template is able to balance the bright colors of the background without overwhelming the text. The layout manages to keep the flyer easy to read even with the amount of text on the template. This two-toned flyer template is designed to draw your attention first to the large, beautiful photo, then guide your eyes to the colorful business name and logo. 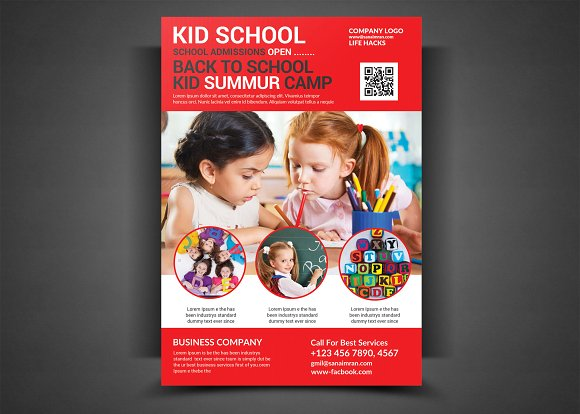 The perforated stubs at the bottom lets you reach more clients just by posting your flyer on a common bulletin board. 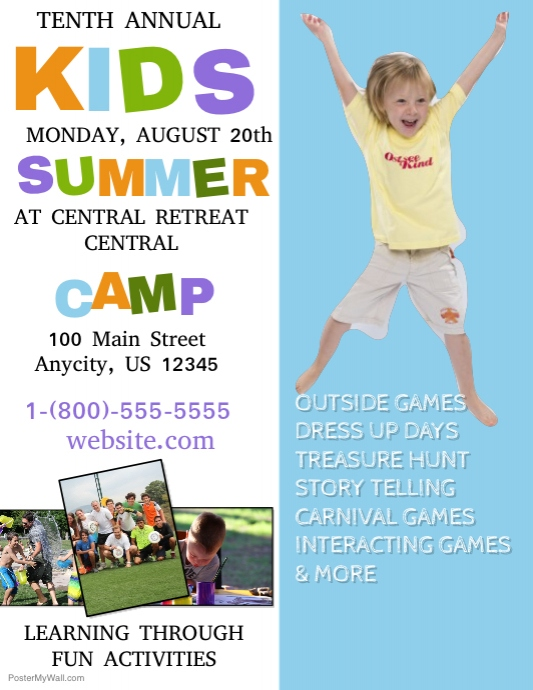 This template is designed for any child oriented program, such as summer camps, kindergarten, and daycare facilities. The layout allows for more images, including your own QR code, as well as different sizes of fonts to help send your message clearly. 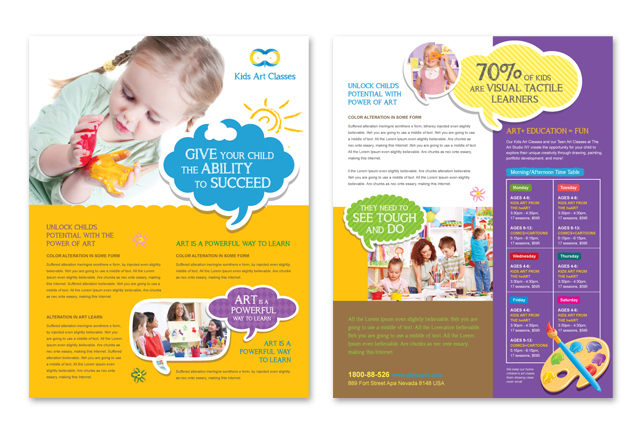 This colorful kids care flyer template is designed using a mix of real and cartoon graphics to make it more appealing to children. The background is kept clean with bright color accents for a fun, cheerful design. This is a simple template that uses a clean layout, with one font design and images that are well organized. The white space on the template makes the flyer easy to look at and the message, clear and well presented. A simpler theme using colorful fonts and images on a white background. 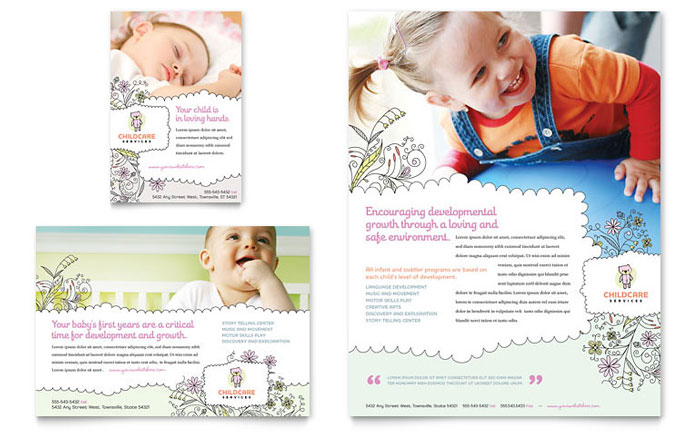 The design around it is kept playful, including the business logo, captions and graphics which helps emphasize the business as a child friendly brand. This template is very flexible and easy to customize. The overall purple theme of the design is used to appeal to a young crowd and emphasize the business brand. 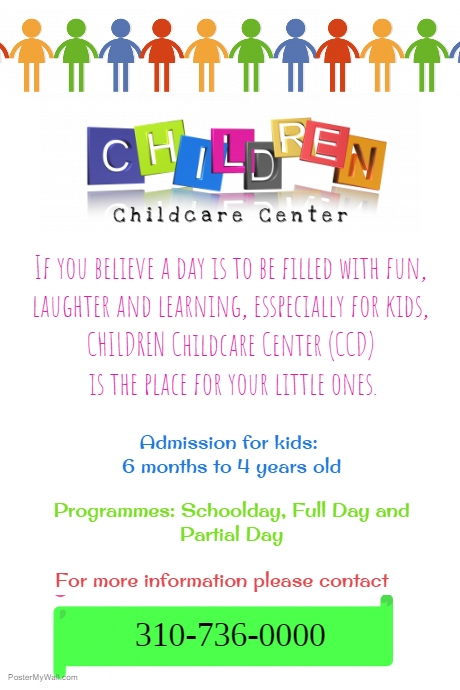 A well made template for daycare and kindergarten school flyers. 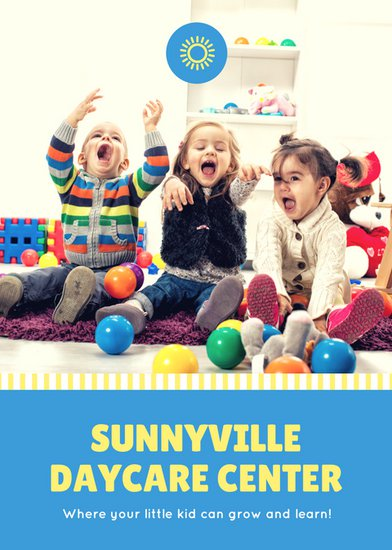 The use of sunny yellows and baby blue colors combined with a playful layout is designed to give readers excitement meant to show how much fun the daycare would be for their children. An adorable and unique flyer design that will make your flyer stand out and memorable. 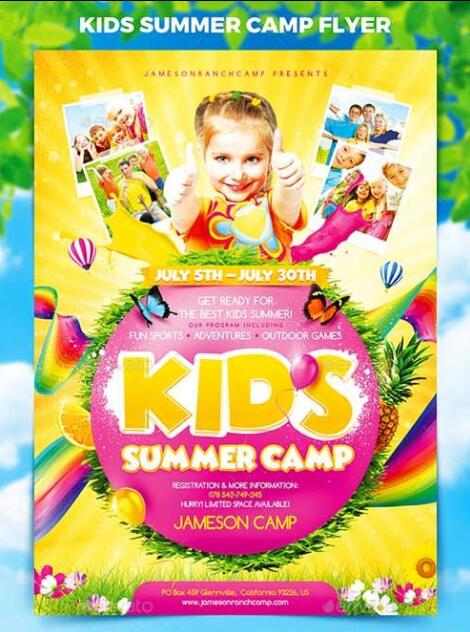 It features hand-painted images of children having fun with a tear sheet at the bottom as an effective hard CTA. The colors and design is completely customizable to fit your brand. A very colorful template that manages to describe fun in as simple as using two distinct images., However you can also notice structure in the layout, suggesting the flexible program one can expect from your business. The back is also printed with additional info and contact details to help readers contact you easily. 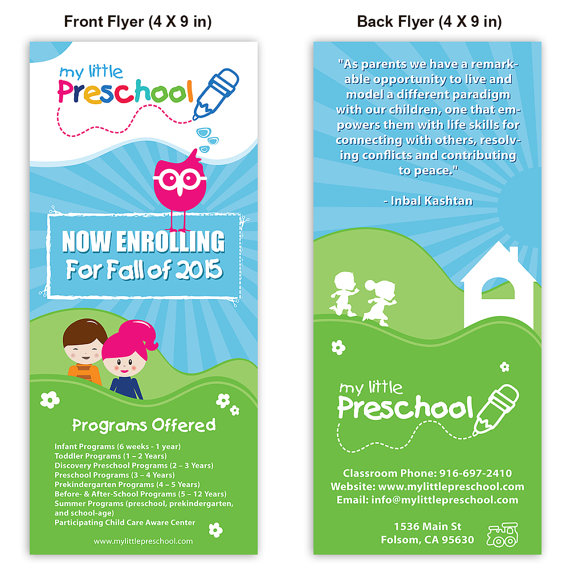 An alternative double sided design that can also be used for daycare flyers. This one used a larger anchor photo and the space at the back for providing the business information and contact details. The color theme, font and photos can be edited to match your brand. This back to back flyer makes use of multiple images on both sides in abstract shaped frames that matches the overall design. The colors and chosen font are also equally playful to easily show what the flyer is all about. 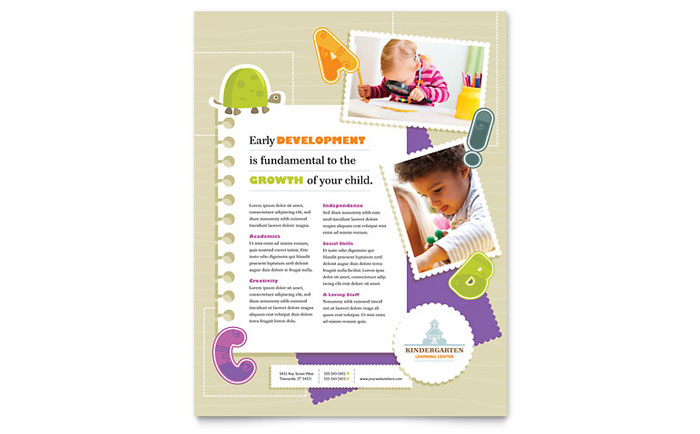 A back-to-back 4” x 9” flyer that’s adorable and attractive for both parents and children. 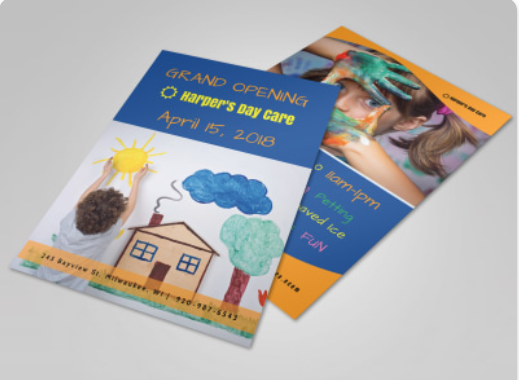 While this is a preschool flyer, the template is highly customizable, letting you change the text and other elements to fit your daycare flyer design. 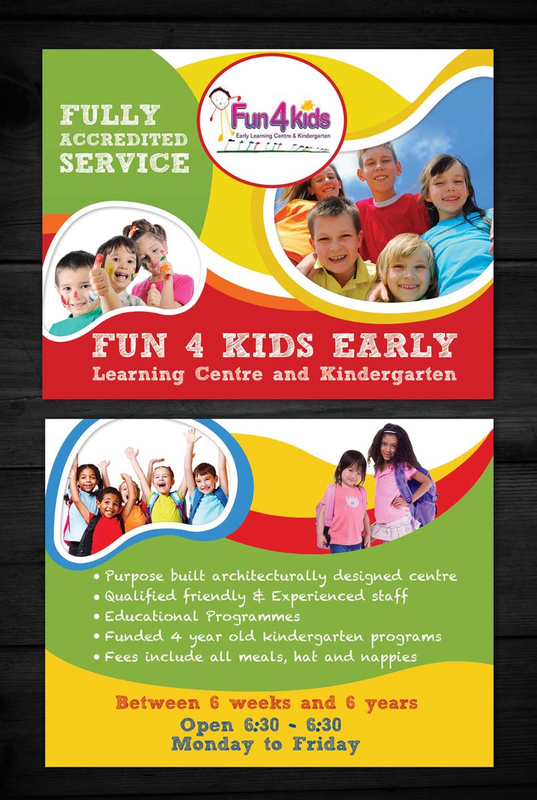 This design is multi-purposed and can be used for promoting daycare facilities, babysitting, and play groups. Notice how the large colorful photo was used both as an anchor image and as a border while the inset text box on top suggest how it’s capable of “managing fun.” The layout makes equal use of text and images and is very easy to personalize using smart object. Mixing illustration with the children’s photos makes for a unique design on this template. The layout gives it a scrapbook feel that sends a clear message for a brand that aims to create fun memories worth keeping. High quality flyer that can also be used as a magazine ad. The design is able to convey the business owner’s skills in one photo, taking care of children in different ages. The layout is simple but playful with wavy borders and collage type photo insets to give an overall youthful vibe. A two-column, blue and white flyer that uses colorful fonts to create design accents. 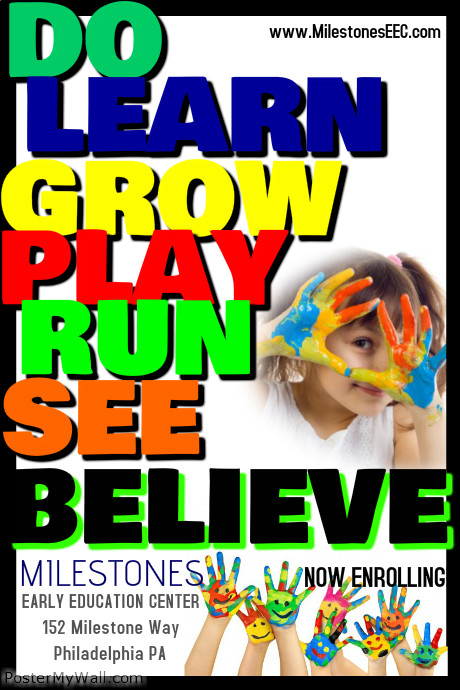 This is a multi-purpose template that can be adapted as a daycare flyer by changing the text and replacing the images with your own. Large, high-impact fonts quickly command attention in this flyer template, even from a distance. 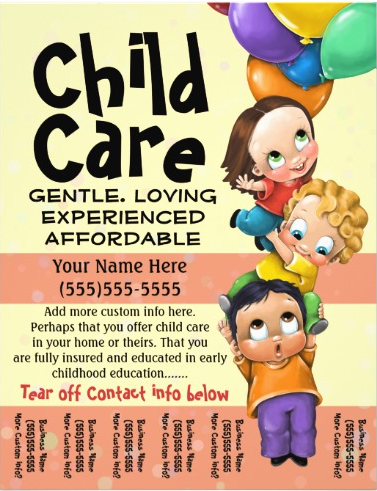 A very unique daycare flyer template design that will make it stand out. Each element can be customized and moved around using the creator’s online editing platform. 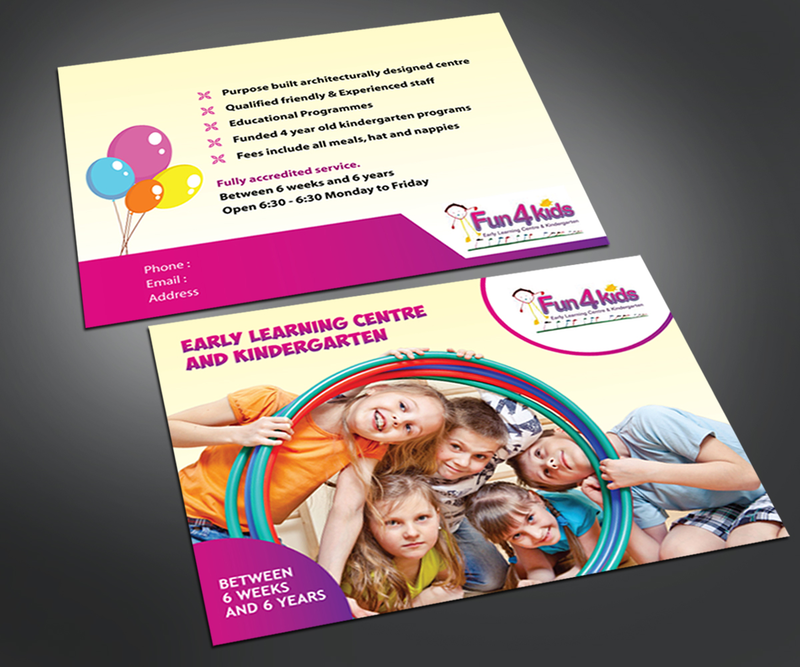 A simple but attractive flyer template specially perfect for kindergarten and daycare businesses. The layout resembles a scrapbook page as if to capture memorable moments in a child’s growing years that any parent would want to have. 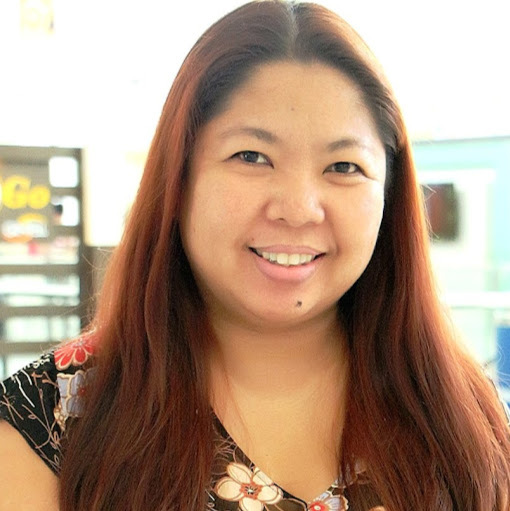 Cap it off with a great copy and motivate potential clients to give you a call. This template makes use of playful colors that any child can recognize. The large image is set on a white background that stands out from the rest of the sections on the flyer. 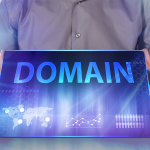 Colors and sticker-like call-outs are used to emphasize the business’ message and brand. 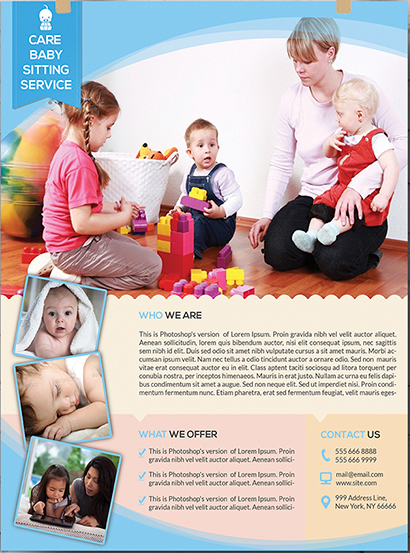 By changing up the images and using your own photos, this template can easily become your own daycare flyer. It’s fully editable with layered PSD files and free fonts you can use to write your own text. Get three different designs when you purchase the pack. 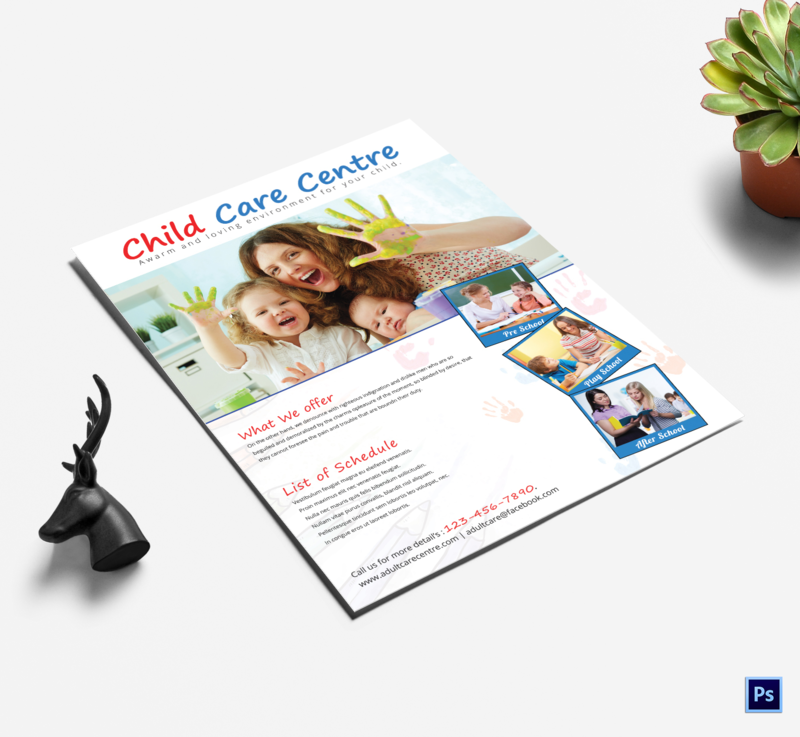 Get this professional looking daycare flyer template in Adobe Illustrator and MS Word format in vibrant colors that can be changed to reflect your brand. The layout makes it easy to include additional information and images without making it look cluttered. This template’s layout is designed to create a personal feel. 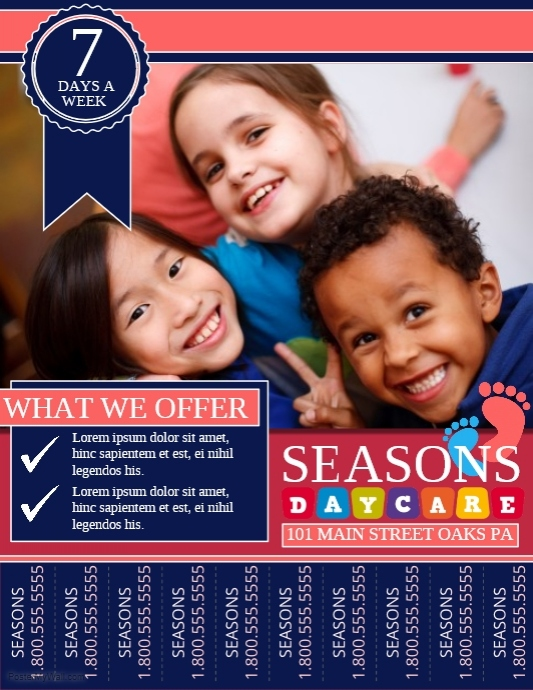 Handwritten fonts matching the business logo makes this flyer attractive for small daycares meant to gain trust of families in their neighborhood. This flyer is available in Psd Ai format. This template comes in baby blues and yellows that matches the simple logo. Replace it with your own logo and colors to emphasize your brand. The back uses the same layout and pattern with three additional sections to add your photos and message including your contact details. 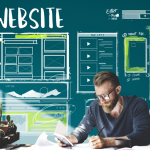 Notice how the template font size and style to capture your reader’s attention. It’s then matched with large images to reinforce the message and get potential customers wanting to know more. Customize the color scheme, text and images, then add your logo to make the overall design memorable and distinct to your brand. 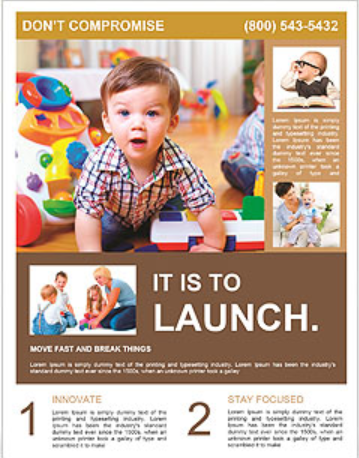 Your flyers will get your daycare business in front of busy parents as they hustle about their day. Try out these templates and see which one works best for you. 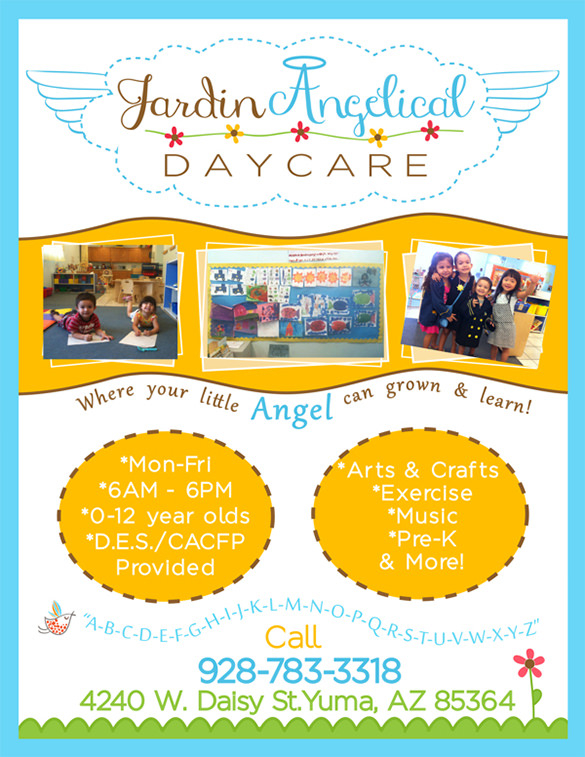 Have your own go-to daycare flyer templates you’d like to share? Let us know in the comment! Signs, posters, menus, postcards & more - 100s of designs!